The optimum temperature in a fridge is approximately 4C and -18C in a freezer; power consumption increases dramatically when lower temperatures are maintained. 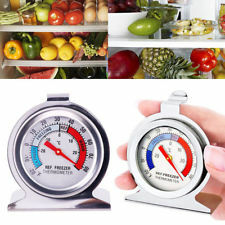 Alternatively use a bespoke fridge / freezer thermometer. If you bought a fridge-freezer today, it would use, on average, 50% less energy than a model available in 1990. By 2020 it is expected to be one of the most energy-efficient appliances in your home. This could mean savings of up to £44 per year. Try not to over specify your fridge freezer. Differently sized A+ rated fridge freezers will use different amounts of electricity. For instance, a 157 litre fridge with an 87 litre freezer would cost about £42 a year to run, whereas a larger 230 litre fridge with a 97 litre freezer would cost £48 a year to run, costing an extra £6 = 20kg CO₂. When purchasing a new fridge freezer, search for these money saving and environmentally friendly features. ​Choose the smallest possible model that suits your needs. One larger refrigerator is cheaper and more efficient to run than two smaller ones. ​Buy an appliance with the best energy rating you can. The most efficient models carry the A+++ rating. Chest freezers tend to be more energy efficient because less cold air escapes when the lid is opened as compared to when the door is opened of an upright freezer. ​When buying a new fridge or freezer find out which refrigerant is used – Greenfreeze hydrocarbon technology is the most environmentally friendly according to Greenpeace.